but I do feel I should be doing more to protect myself. First of all, I split this question off from the Hot Footing thread since what you are asking is not dealing with the questions found in that thread. There is a lot of information on protection for yourself, your home, your family, and your vehicle at the Lucky Mojo website. There is a Fiery Wall of Protection mojo bag so if you are concerned about ongoing protection for your physical self that might be something to look into. After checking out those pages if you have more specific questions we'll be glad to help. I bath once a week in a cleansing/protection bath, scrub daily with Kosher salt, and continuously burn a protection candle. I find most people let this area lax for some reason and it is actually an area that should never let go. Protection works against pretty much anything, especially if it is continous. In my experience, I catch things much quicker when I keep myself protected. I will notice someone working on me quite quickly and be able to work through sticky situations much faster. 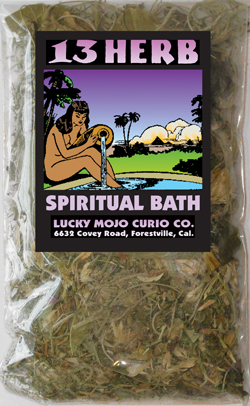 I love the 13 herb bath and you can scrub with salt on a daily basis too. literarylioness wrote: I bath once a week in a cleansing/protection bath, scrub daily with Kosher salt, and continuously burn a protection candle. I remeber your advice in another post about using salt to cleanse daily. I took your advice and have been scrubbing down right before I finish my regular daily showers. My skin is a bit sensative and I realized as I apply the salt to my skin and give a little rub its really irritating. I have been improvising by dissolving a hand full of salt in a bowel of water and pouring it over my body. I rub down ward and rinse. Its that sufficiant? Thank you for any advice! The use of straight table salt is irritating to many people. I would suggest using bath salts instead -- they are blended to be gentler to the skin. justv wrote: I remeber your advice in another post about using salt to cleanse daily. I took your advice and have been scrubbing down right before I finish my regular daily showers. My skin is a bit sensative and I realized as I apply the salt to my skin and give a little rub its really irritating. I have been improvising by dissolving a hand full of salt in a bowel of water and pouring it over my body. I rub down ward and rinse. Its that sufficiant? Thank you for any advice! You can disolve the salt in water and pour it from the base of your neck downward too. I use an Italian Kosher salt that I like a lot, because it makes my skin smooth. 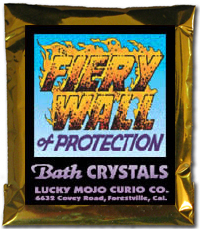 Could someone please tell me when seeking protection...even if you carry a mojo (for protection...eg...fiery wall of protection) should you continue to take protection baths and/or work protection spells? Some folks do have to do ongoing protection work and also cleansing work because the other side of protection is cleansing. It depends in large part on what your situation is. Keeping protection around your home, car, job, and taking protective baths, especially if you have good reason to believe that you might be under constant attack. i was wondering about that, every week i take a protection bath with hyssopo and sea salt, baking soda, kosher salt in my bath tub and i stay around 15 minutes, after that ,every other day when i take my shower, i rub my body with salt and sage and i rub my pulse with van van oil and my head. is good enought for protection? That is not protection. That is more along the lines of cleansing. Protection is doing a firey wall of protection to prevent a protective barrier between you and negativity. Cleansing is to get rid of the negativity. That is what you are doing. If you want some protection, you can work with St Michael, or get a mojo bag made with protective herbs. You can also get some forty thieves vinegar and pour it around your property. I mean there are various ways to protect yourself. You can also wear some jewelry for protection as well. Personally, I dress his candle with archangel root aka angelica root because its good for all archangels. I use a red candle for him, and then I say his prayer. Also, I write a petition under his candle for who I want to protect or I put their picture on my altar. I did my first St Michael candle and it burned in 5 days for protection. It went out last night and I notice that it had burned clean and now it full of black sut? Can anyone tell me what this means. I know leaving the black sut behind in not good, but what would it mean since it's a St candle for protection? First of all, if you had loaded it up with oils or herbs, then that could have contributed. On the other hand, someone could be working against you, but I would cleanse myself, while burning another St. Michael candle. Its hard to tell just off one candle, but if you loaded it up with herbs the herbs burn when it gets to the bottom and can light on fire creating the soot. So cleanse yourself, and burn another. starsinthesky7 wrote: First of all, if you had loaded it up with oils or herbs, then that could have contributed. On the other hand, someone could be working against you, but I would cleanse myself, while burning another St. Michael candle. Its hard to tell just off one candle, but if you loaded it up with herbs the herbs burn when it gets to the bottom and can light on fire creating the soot. So cleanse yourself, and burn another. Thanks Star - I didn't put any herbs and just put a little olive oil. I guess it will be something I will be asking at my next divination lol. But I will light another one and see what happens. What should I put in bath for protection? I would recommend that you get the book Hoodoo Herbs and root magic. 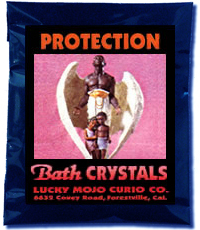 As for a protection bath, you can get fiery wall of protection bath crystals, or regular protection bath crystals. There is nothing you have to put in the protection bath. 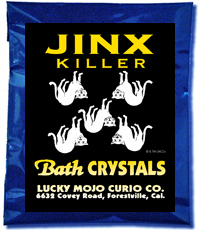 However, I would recommend that bath crystals as they are easy to do. You can also work with bar soaps as well. I second Starsinthesky7's recommendation, HooDoo Herb and Root Magic is an excellent resource. Really, what you put in your protection bath really depends on what you are trying to protect yourself from, also if the bath is for a chilld, there are certain herbs that are especially potent in protection for them. For a general protection bath, I like to use agrimony, basil, eucalyptus, ginger, marjoram, rosemary, rue, star anise, and peppermint oil (for the scent and tingly clean feeling). You can use all or any combination of these. I was reading one of the articles on the LM site, and there was a section that stated "if you put salt, red pepper, black pepper, and saltpeter in your shoes, then you will not be hoodooed." Since I read that, my mother and I have been sprinkling those same ingredients (minus the saltpeter) in our shoes daily. However, today, I read somewhere that Hot Foot Powder is made from (Red pepper, black pepper, and salt). 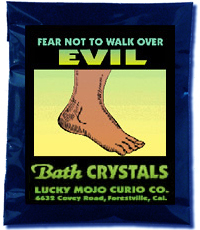 I understand that Hot Foot power is used for hexing and crossing, but my intentions are for Protection, not harm. Is is possible that I could have possibly hexed myself and my mom?? You are asking the spirit of each mineral to protect and shield you from evil. You are also correct in that Red Pepper is an 'ingredient' in Hot Foot Powder' but that is not your intention. Thanks jwmcclin for helping clarify that for me too. jwmcclin said it perfectly! The only thing that I would add is that pepper is one of the most commonly used ingredients in conjure and it is deployed in a variety of ways--it can be used as you have noted in both cursing and protecting contexts and it can also be used in healing contexts--especially hands on type work where oils, lineaments, and rubs may have certain peppers as part of their ingredient to create a warming and tingling sensation when applied--this is useful for sore muscles and other maladies as well. Good day my fellow folks, I am going to give you a real southern from the state of Ga bath, that will kill all jinks, curses, bad luck, and bring new life. This spell is so powerful. It is simple but powerful. On tues. morning or when ever you take a bath you can use your everyday soap but add some Chinese Wash to the bath to cover the smell. and bath in your normal way, but follow these steps. Add 9 drops of turpentine and read psalm may 37... 3 times and say "in the name of the father, Son and Holy Spirit may all jinks, bad luck, cureses come to a end and while my problems go down the drain may you bring me a new life"
Say this while you drop the turpentine in your bath water. While you are taking a bath think of the end of all of your bad luck and hard times. You know the smell of turpentine is strong it will remove all of your bad spirits and remove all evil. While you are taking a bath you will feel the spirits remove all of your problems. You will feel better. Nnow get out of the tub and open the drain and let the tub drain. Now you say "may all my hard times and bad luck go down the drain." Now you air dry while reading psalm 51, 3 times, and say "in the name of the Father, Son and Holy Spirit.. May my old life go down, and a new life come up." Now go out the front and go own your way. Repeat every 2 weeks..." no one will be able to harm you"..."Also while you are doing fast luck, Money Drawing, Love, this is a spell to protect and make thing go some in the right way.. This is power. Goodboy that sounds like great work!! Thanks for sharing. Thanks for the share I'm from Alabama and my family used a lot of pine around the house. When I was little, our dirt driveway was covered in a layer of pine straw to combat mud. Likewise, pine straw in the flower beds kept weeds down and made the beds look tidy. If we had a cut or scrape, Daddy would pour turpentine on it - that'll light you right up! Of course, Mama liked to mop the floors with Pine-sol. To this day, a house doesn't seem clean to me unless it smells like pine! Moonbreath: I have always loved the smell of pine and forests full of pine needles. Delicious and it always reminds me of clean air and cleanliness! Brew the herbs into a tea, strain, and add a half-handful of salt. It is customary to recite a Psalm over the herbs while preparing them. A good choice for Protection is Psalms 91. Another favourite is Psalms 121. You may bathe by pouring the prepared herb tea into a filled bathtub of warm water. If you only have a shower, we recommend diluting the tea -- one part tea to three parts warm water, and pouring it over yourself, then rinsing with shower water. I have a friend who had a similar situation, she had a bathtub but it was old and the plug did not work, thus the water ran anyway.. she purchased a big bucket like a beer bin and put it in the tub and used that to pour the water in and rescoop. you definetly want to delute it though as Cat said cuz the bins don't hold as much water as a tub!! Iv also heared of ppl putting them in spray bottles.